I am constantly asked for party food ideas and potluck recipes. This time of year people are booked solid with graduations, family reunions, BBQs and patio parties, and it all kicks off this weekend with Memorial Day picnics. 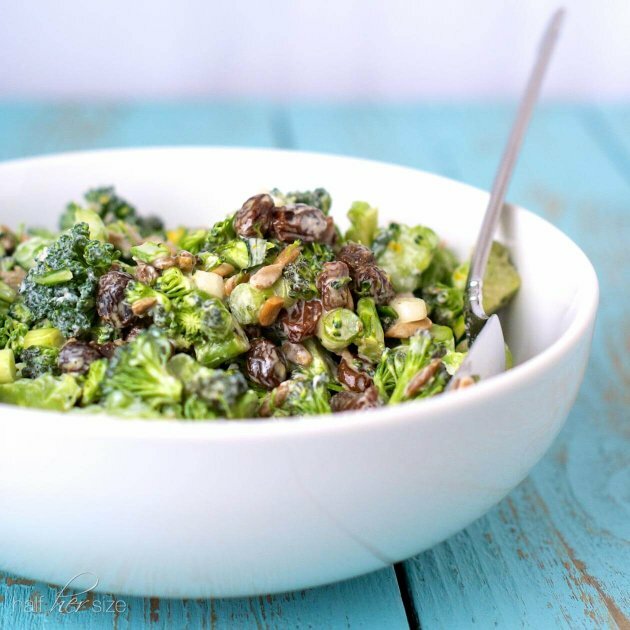 Quick and easy deli style broccoli salad with raisins, sunflower seeds and green onions. 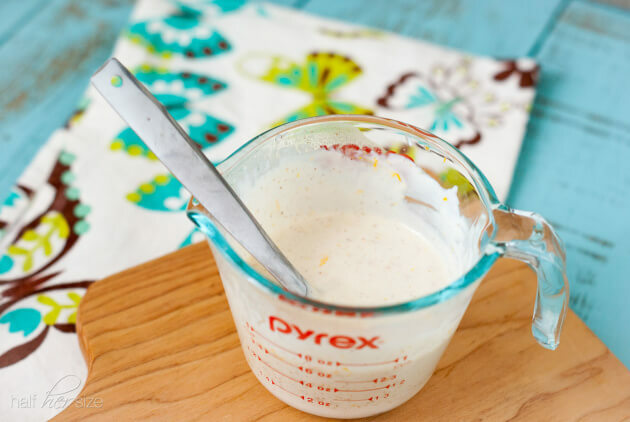 A modern twist on honey mustard salad dressing recipe with Greek yogurt and orange zest. Perfect over salads. May also be used as a sandwich spread, or a sweet & tangy dipping sauce. Very low in sodium, a good source of fiber and protein, and 2 Weight Watchers Points Plus per serving. I have a heart for feeding people. I like to be able to share my favorite foods with as many people as possible. I also like to show off the fun side of healthy eating. To begin, I lean toward vegetarian recipes. When possible I consider if it can be made gluten-free. Finally I opt for ingredients that are full of fiber with a modest amount of protein. These later choices are part of my weight loss survival guide. I want to know there will be at least one dish that will fill my tummy if the healthy options are slim to non-existent. Get Excited: If you are looking forward to eating what you bring, it is easier to pass on the less healthy offerings. Wow Factor: Choose ingredients that add a pop of color or a burst of flavor with out adding calories. Make Ahead: Select a dish that will be great if made a day in advance so you aren’t scrambling at the last minute. Plays well with Others: Imagine your dish fitting easily with a variety of entrées (grilled meat, fish, casseroles, etc). I give an honorable mention to “keep it simple.” Quick & easy are certainly a bonus but, when time allows, a party can be a great reason to make a little extra effort and step out of your usual routine. 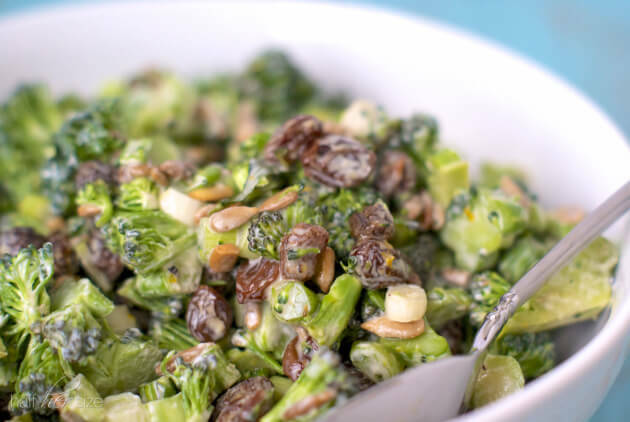 In the case of this broccoli salad, however, we are going to achieve all of the above AND keep it delightfully simple! The vibrant green broccoli jumps out from the usual sea of chips and bean dips. It has a unexpectedly enticing citrus scent. And, really, it is hard to go wrong with a creamy salad dressing. The dressing’s sweet citrus tang cuts through the usual bitter notes of fresh broccoli and cools any spicy barbecue sauce or salsa that may also be on the menu. The light cider vinegar acidity creates harmony when cuddled up to a scoop of sticky brown sugar baked beans. Is this dish vegetarian? Yep! Is it gluten-free? Check! It is even free of nuts, if that is a concern. But, it is not what you leave out that makes this salad a star. This party ready salad is all about the goodies you have mixed in! Goodies that will probably result in whispers of, “who made this salad?” and nothing but an empty bowl to take home. Creamy Broccoli Salad, you may be the perfect potluck food. When you begin your Amazon shopping here we receive a small affiliate commission. Thank you! Make this versatile salad a day in advance to let the flavors mix and mingle overnight or throw it together right before the meal begins. The dressing makes just enough to coat the salad with a flavorful creaminess but stops short of becoming heavy or gloppy. Make sure to add the orange zest to the dressing it gives this salad a playful twist. This creamy dressing has a lightness you won't find in a bottle. It is quick to prepare and can be used to top a salad or in place of the usual condiments on a burger, wrap, or sandwich. 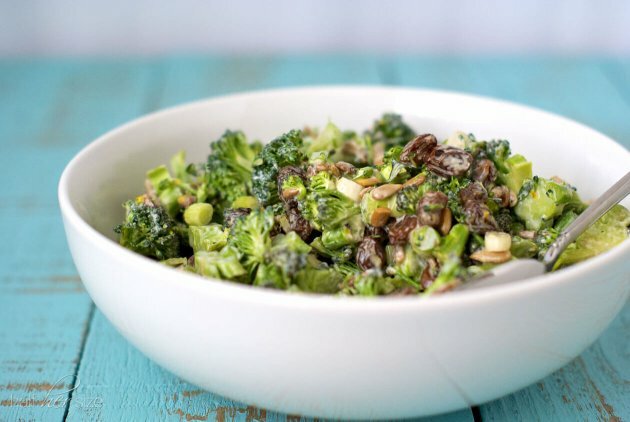 In large salad bowl, toss together the broccoli salad ingredients then pour over the prepared dressing and stir until the salad is fully coated with the dressing. The finished broccoli salad may be served immediately but, the flavors will be at their best when allowed to chill 4 hours up to overnight. 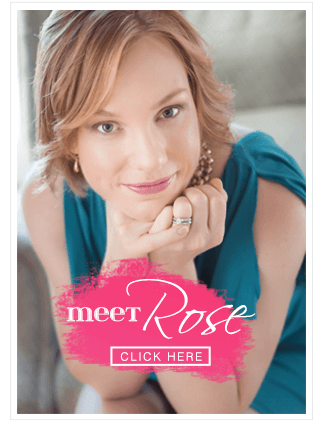 Use this recipe as a blue print and adjust the flavors to fit your mood or the season. Substitute dried currents, cranberries, or cherries for the raisins. For a bolder onion flavor try minced red onion or shallots in place of the green onion. Move over store bought salad dressing! Orange zest and apple cider vinegar give a fresh sweet and tangy wake up call to old fashioned honey mustard dressing. The creamy texture of Non-fat Greek yogurt adds additional tang and raises the indulgence factor. 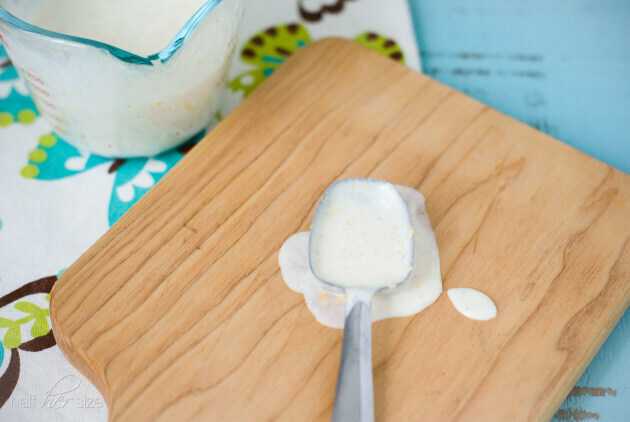 Makes a wonderful salad dressing, vegetable dip, or all around great condiment. Whisk together ingredients. Chill until ready to serve. I made this salad last weekend for a memorial day BBQ. It was so easy! I made it the night before so it would have time to marinate. It was really yummy and the perfect side dish for spicy BBQ. The best part is there were leftovers which I have enjoyed all week for lunch and everyday the flavor got better.